Ring in the New Year with another generic romantic comedy. 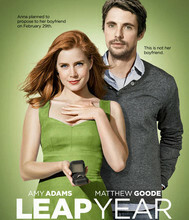 At least this one is tolerable with the always-loveable Amy Adams (Julie & Julia) and the endlessly charming Matthew Goode (A Single Man, Watchmen) leading the way. Such talent should signify similar quality, but this will become just another IMDB listing for these two, as well as the wholly underrated Adam Scott. There are plenty of good romantic comedies out there, but this will just become one among the many that are soon forgotten. Anna (Adams) is the typical American girl whose life is driven by success and material rewards. She’s in a stable relationship with her cardiologist boyfriend Jeremy (Scott) and applying for an apartment at the building of her dreams. Her career staging houses for realtors is going strong and her life is progressing just as she’s always hoped. That is until she believes Jeremy is going to propose to her and he doesn’t. Desperate for the one thing she doesn’t have, a fiancée (and an engagement ring), she decides to take on an old family myth about her grandmother — told to her in an odd cameo by John Lithgow as Anna’s father — and propose to Jeremy on leap day. The Irish tradition is that on February 29, during a leap year, women are permitted to propose to men. Jeremy just happens to have left for a conference in Dublin and Anna decides to follow him and get engaged. Unfortunately, bad weather grounds her in Wales with just days before the 29th but she must get to Dublin by any means possible. She’s soon stranded in a small Irish town where she meets pub owner, hotel owner and taxi driver Declan (Goode). Despising Dublin, but in debt and needing the money, he agrees to drive Anna despite their mutual loathing of each other. His laid back, go with the flow attitude clashes with her precise and materialistic manners, but soon enough they’re on an adventure together. From here, it’s by the numbers. The two hate each other until they’re forced to spend time with one another. And what should have been a simple, uncomfortable car ride turns into more of a bumpy ride than they intended after their car is quickly crashed. Even while this movie is unoriginal from top to bottom, it’s common threads are still barely attached. Only Anna is barely characterized, and even her story is thin. Director Anand Tucker’s (Shopgirl) intentions are muddled at best and the editing is second rate. Even the “love” that blossoms between Anna and Declan feels forced. There really isn’t much more to say than that this is a film that’s been done hundreds of times before, and with better results, but it could be worth a mindless viewing for Adams and Goode alone.